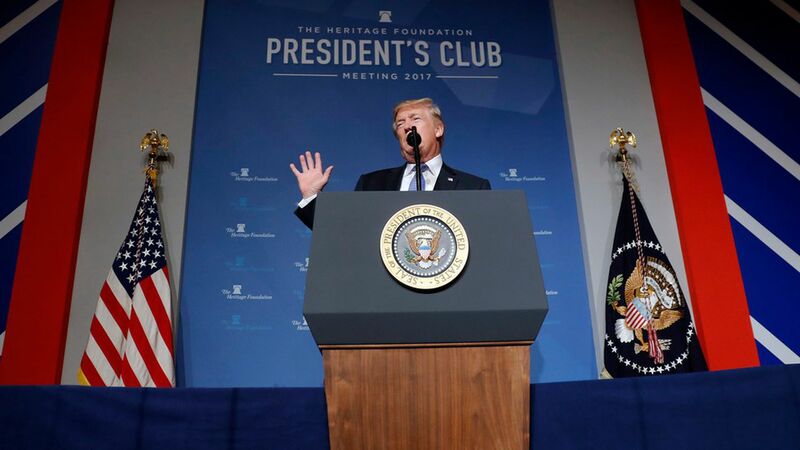 Trump says push to remove statues "has to be stopped"
President Trump addressed the Heritage Foundation, a conservative think tank, on Tuesday night, saying everyone in the room was united by the belief that "we should preserve our history, not tear it down." "Now they're even trying to destroy statues of Christopher Columbus. What's next? It has to be stopped, it's heritage." Trump also told the crowd at Heritage to expect a "Christmas present": "You're going to be saying Merry Christmas again." One more thing: On the health care front, Trump said of the new bipartisan bill introduced Tuesday afternoon: "While I commend the bipartisan work done by senators Alexander and Murray, and I do commend it, I continue to believe Congress must find a solution to the Obamacare mess instead of providing bailouts to insurance companies."